With a month left in the Major League Baseball season, the playoff races are heating up. 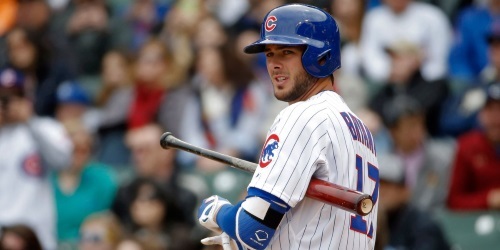 The Chicago Cubs look poised to finish the regular season with the best record in the Majors, thanks to Kris Bryant. Kris leads the National League in nearly every standard offensive statistical category, and is running away with just about every advanced metric as well. The only competition is seemingly coming from Corey Seager of the Los Angeles Dodgers, who will likely walk away with some Rookie of the Year hardware this year. But if you look at everyone’s favorite metric, Wins Above Replacement, Kris Bryant is head and shoulders above the rest of the league. As of September 1st, Bryant leads the NL with 7.0 WAR, which is 1.6 higher than Seager who is in second. The distance between 2nd and 10th (Carlos Martinez of the St. Louis Cardinals) is only 0.8, which really puts Bryants season into perspective. Kris Bryant is fourth in on-base percentage (.402) and second in slugging (.591), which gives him a ridiculous .993 OPS for the season. Kris leads the National League in runs scored (111) by a wide margin over Nolan Arenado (98) of the Colorado Rockies; who also has the benefit of playing in hitters friendly Coors Field. Bryant is currently tied with Arenado for the NL Home Run lead at 36 and is fourth in RBIs (90). No matter which way you slice it, Kris Bryant will likely be your National League MVP for the 2016 season; which will give him a rare accomplishment. No player has ever won all four of these distinguished awards, much less won them in consecutive years. Jose Canseco and Dwight Gooden won 3/4 awards, but never went to college – stay in school, kids.